The Petra room is spacious, has a double bed (with two mattresses) and stunning views over both the Petra mountains and Wadi Musa. Also suitable for a family with up to three kids! The room gives access to the cosy back terrace. Here you can have your breakfast or enjoy the sunset sitting on the Bedouin mattresses with the Petra mountains in the backdrop. You can use the shared pink bathroom. There is no air-conditioning and no central heating in the room and rest of the B&B. The price for this room is for one night 40 JD per person. For two or more nights there’s a 10% discount so 36 JOD per person per night. The price for children under 12 years is 17.50 JD per night sharing the room with their parents. Children under 3 years stay for free. (Children share a 1.20 m wide bed with their sibling). Breakfast is included. And linen and towels are provided. 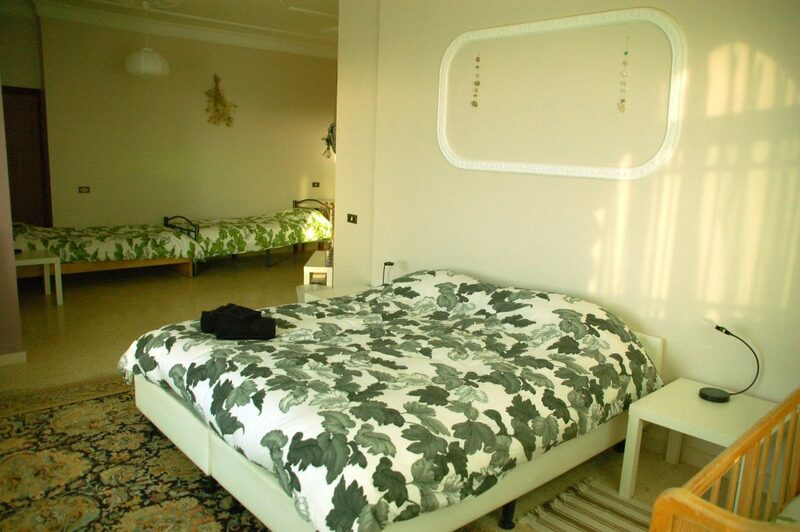 The double bed can be changed in to two single beds. Up to three extra beds can be added if you would like to stay in this room with your children or with a group of friends. Want to reserve the Petra room? Book now!